Question: How does a community collect 4,660 pounds of fresh produce to give to those who can’t afford to buy them in the stores? Answer: One bean at a time. Have you ever noticed what the most expensive items are in the grocery store? Other than the obvious things like meats, it is expensive to purchase fresh fruit and vegetables. If you are trying to feed a family on an income that barely pays the mandatory bills, it’s understandable that you would save money in the grocery store by purchasing items that are less expensive and stretch further…..usually highly processed foods. In our ‘Who Is My Neighbor’ post about Home Sweet Home Ministries a few weeks ago, we told you that we donated 4,660 pounds of produce to Home Sweet Home’s Food Co-Op in 2016. Pretty incredible, right? But that food didn’t just appear at Calvary’s doorstep to be delivered to those in need. It started with a vision in Fred Nimke’s heart…...a desire to use some of Calvary’s property to feed others. This is truly a ministry of hard work, dirt, and lots of time. I grew up on a farm and my brothers and I can still remember the dread of hearing my mother in the garden in the very early hours because we knew we would have jobs of breaking beans or shelling peas later in the day. If only it were that easy. The servants in Calvary’s Community Garden will soon be preparing the ground, planting seed, weeding, watering, building trellises, planting, weeding, watering, weeding (do you see a theme here? )....and finally…...harvesting one crop after. Now let’s move to the other end of this process…….the shoppers at Home Sweet Home’s Food Co-Op. This is much more than a food pantry where people can come in and pick up food when they need it. This system invests in those using it and requires the participants to give back by volunteering somewhere in the community or Home Sweet Home for 2 hours per each shopping trip they make. This builds a community of reciprocity in which people know they are not just recipients but active participants in the process. I learned never to tell my mother that I was bored in the spring or summer…...there were always weeds to be pulled in the garden and I wasn’t interested in doing that! 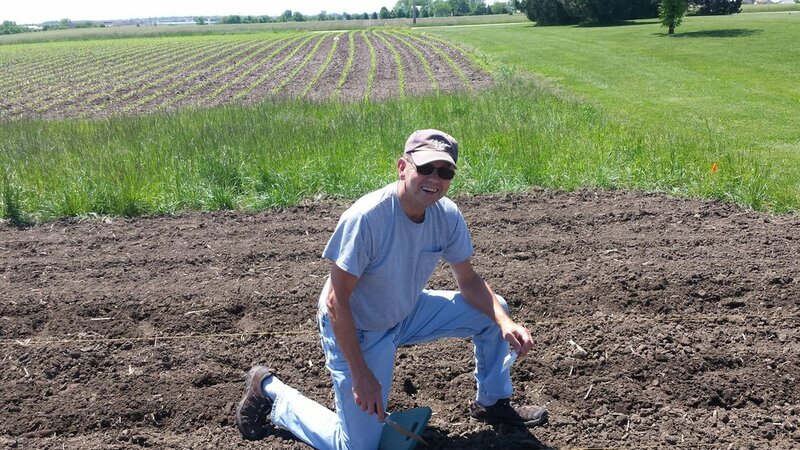 I am so very grateful for the many people at Calvary who find time to get down on their knees in the dirt and pull those weeds, water the garden, and complete so many other crucial duties in our central Illinois hot and muggy summers…...all for produce that will be given to folks we may never meet. What a great way to honor our neighbors throughout Bloomington/Normal as we partner with them to provide affordable fresh produce. Thank you, planters and weeders alike!